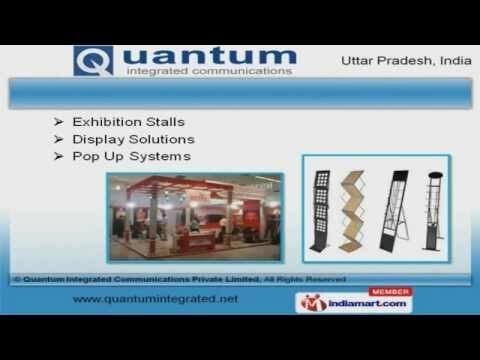 Welcome to Quantum Integrated Communications, Manufacturer and Service Provider of Exhibition Stall Displays. The company was established in 2009 at Noida. Latest techniques and methodology make us unique in the industry. Our Superior quality products and services help us to serve Clientele like Aska Equipment and Centum Electronics. Exhibition Stall Displays, Promotional Exhibition Stalls and Banner Stands are some of our products and services. Exhibition Kits, Promotion Portable Tables and Stall Displays are some of our best selling products. Our clients can avail from us an exquisite range of Exhibition Stalls, Display Solutions and Pop up Systems that are cost effective. Along with that we offer Leaflet Stands, Shell Schemes and Promotional Counters that are a class apart. Our Portable Exhibition Solutions, Exhibition Stall Designing Services and Stall for Trade Shows are highly efficient. We are instrumental in offering a high quality range of Banner Stand for Offices and Leaflet Stand for Multiplexes.